I’ve been blogging for many years, firstly on hosted services like Typepad, then moving to hosting my own WordPress installations for several blogs. It’s a bit more effort to host things yourself, but you do get total control over your site, something I wanted. I also like to know how things work, and work in computing, so it was fairly straightforward for me to do. I found Media Temple to have a good hosting service (they allow you to install your blogging software, but manage the server, database, etc.). If you want total control, then you can rent a virtual server and do the whole lot yourself, from operating system up. I used Linode, and found them to be excellent. At this point I was running four blogs and experimenting with some other server-based software, so the extra work involved made sense. Time. Having a child changed my priorities. I want to spend as much time as I can with my son, so it was clear I needed to re-focus on the other things I was doing. Blogging was always a means to an end – getting my photos and words published. While tinkering with the platform was fun, from a technical and curiosity point of view, I needed to free up as much time as possible to spend with my family and actually get out and do photography. Photography lifts my spirits and satisfies my ‘soul’ in a way nothing else does. I’d far rather be exploring a new place or walking across countryside and photographing it than sitting at a desk tinkering with my blog. It became clear to me that there were distinct disadvantages with hosting my own blog. Occasionally I would post something that got mentioned on a popular site. Suddenly, my blog would get lots of traffic for a short period, and suffer excruciating slowdowns. Not an experience that would encourage any of my new visitors to come back. Going for a fully hosted solution would avoid these problems – a spike of a few thousand visitors on my blog would be nothing in the context of millions of visitors a day. Not having to cope with that would reduce a lot of effort on my part. I had used WordPress software for years, so it was natural to look at WordPress.com, but I also spent some time with Tumblr, as it is also a very popular service. Yay! My moment of fame - it seems there was more interest in the Falkirk Wheel than I thought! There were some distinct differences when I first looked (around a year ago). Tumblr has always concentrated on the social experience, allowing users to share and ‘like’ posts on other users’ blogs. This is a great way to get additional publicity for your work. WordPress has been catching up though. Other WordPress.com users can now ‘like’ posts, and WordPress.com promotes hand-picked posts to its front page, which is fantastic publicity. This happened to me a few weeks after moving my blog to WordPress.com, and resulted in thousands of visits over a weekend, and a lot of new followers. It was very exciting! WordPress.com seems to have had a lot of development effort put into it the last year or so. Most months there is an improvement rolled out to the users, and most seem to be genuine improvements. No other blogging system appears to have the level of focus and drive being put into it that WordPress does. While I could choose from a huge number of great themes when running my own WordPress site, there are very few available on WordPress.com (you cannot install your own themes). Unfortunately, there are very few available that I like (I realise that this could be quite subjective). Most seem old-fashioned or amateurish. Having premium themes available has helped, and I do like the Minimum theme that I use on this site, but there are some really beautiful themes out there for photographers that I would love to be able to use. Allan Cole’s AutoFocus 2.0 is an outstanding theme that I used on my self-hosted WordPress site, and I would gladly pay again to use it on WordPress.com. Woo Themes have a wonderfully flexible theme called Canvas, that has a portfolio module, which is also superb. Some of these really great themes need to get onto WordPress.com. The other annoying thing with themes and WordPress is that it embeds the image size in posts, according to the dimensions of your current theme. The problem with this is that if you switch to a another theme (particularly one that allows larger images), then they are stuck at the original size, unless you go through all your posts and re-insert the images. Tumblr manages to completely avoid this issue, and allows dynamic sizing of the images depending on the theme or global settings. I really think WordPress should be this flexible. Whichever blogging system you choose, there will be compromises. In giving up some of the flexibility of running my own blog, I have gained hugely in the amount of time I have available to make photos and to write. It’s hard to put a price on that, but allowing me to focus on what is important has been hugely freeing. And for that, I must thank all the folks behind WordPress.com. I have always wanted to host a blog. The vast amount of themes available for photographers is amazing! Hosting seems expensive though. 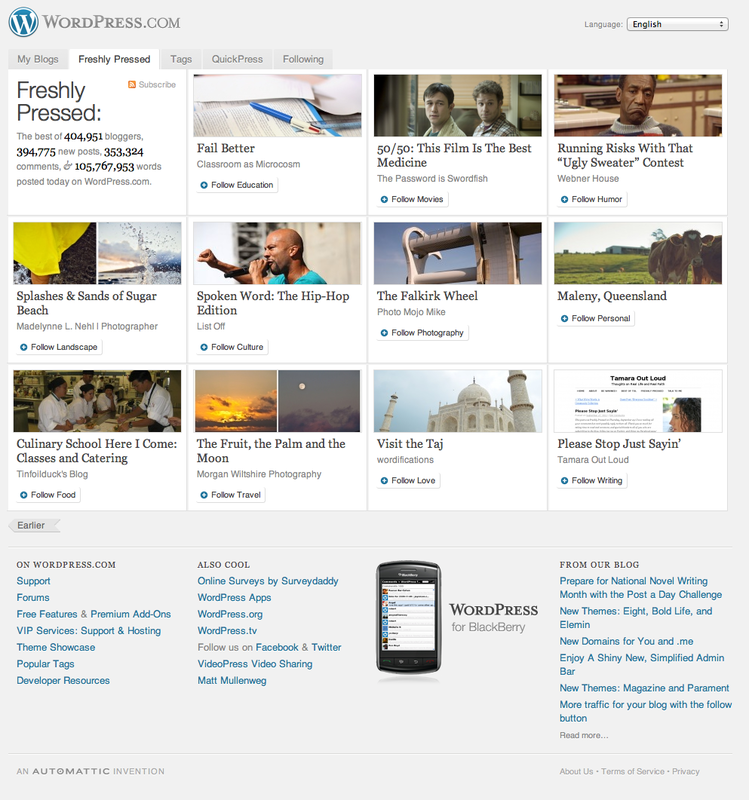 Although WordPress.com limits theme choice, the community is great and the platform is easy to use. So far I have loved it. I am waiting patiently for that amazing theme to come to WordPress. The community aspect is great, and I’ve made contacts with some great photographers as a result.